Our tempered or laminated glass handrails offer limitless opportunities to complete your rail design with safe, durable, architectural glass. From base shoes to custom stainless steel supports, interior or exterior, Ryan’s all-glass can help design and build glass handrails for all your residential or commercial rail needs. 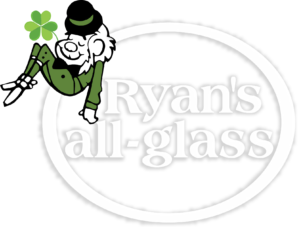 Ryan’s all-glass can take care of every step of the process. From design to installation, we give you the handrail you have always wanted. Tempered or laminated safety glass provides added strength and safety to your handrails. When adding glass handrails to the balcony or stairwell of your home or business, you want the safest and strongest options available. Ryan’s all-glass uses only tempered or laminated glass for handrails, because either glass withstands more pressure than regular glass. After undergoing the process of heat treatment and the pressure cooling process of quenching, tempered glass becomes, on average, more than 4 to 5 times stronger than traditional glass. The process also changes the structure of the glass, allowing tempered glass to shatter in a safer way, which means tempered glass does not break into sharp pieces, but shatters into relatively small, safe pieces. Laminated glass offers the same level of safety in that two pieces of glass ‘sandwich’ a piece of vinyl inner layer. In the event of breaking, it is held together by the inner layer. When considering the elegance and beauty of a stairwell handrail, we often take into account not the handrail itself but the base shoes, posts, and steel supports. How well do they match the glass and the design of the surrounding room? Do you want an elegant look with base shoes hidden within the floor? Or do you want a more commercial look with stainless steel posts in plain sight? 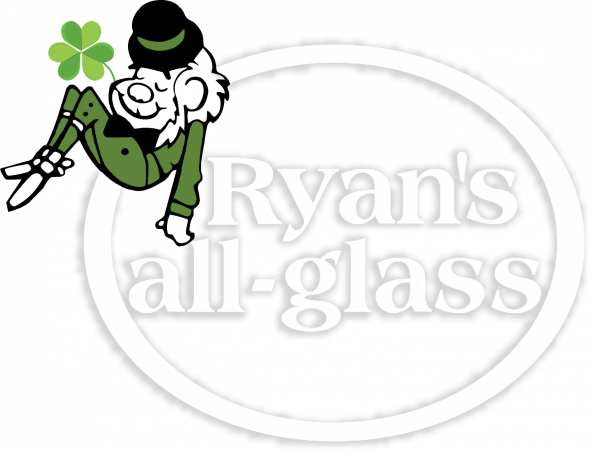 Ryan’s all-glass can accommodate any look you want. We have a wide selection of custom base shoes and steel post supports that suit either indoor or outdoor railings, and we can incorporate any design elements or styles you want. We are a glass company with more than three decades of experience, and this gives us the skills to work with you on the most elegant and difficult handrail projects. Don’t go to an inexperienced glass company. Choose Ryan’s all-glass for your new, exquisite glass handrails. A glass handrail on a stairwell or balcony can add a level of sophisticated beauty to your home or office. Make sure the job is done right the first time. Contact Ryan’s all-glass today, and we will put our thirty years of experience to work for you.